The game’s first tournament is right around the corner. Respawn Entertainment and Twitch revealed the first official big-money tournament for Apex Legends—and fans are already rife with anticipation for the event. The Twitch Rivals Apex Legends Challenge will be a two-part competition on Feb. 12 and 19, featuring 48 Twitch streamers and a $200,000 prize pool. We don’t know much more about this event yet, though. Here’s how you can watch the Twitch Rivals Apex Legends Challenge. The tournament is set to run on Feb. 12 and 19. The European portion of the competition will begin at 11am CT, while the North American region will begin play at 3pm CT.
Forty-eight popular Twitch streamers will be participating in this Apex Legends tournament. Some of the most notable streamers announced to be participating in this event include Guy “Dr DisRespect” Beahm, Jeremy “Disguised Toast” Wang, and Michael “shroud” Grzesiek. 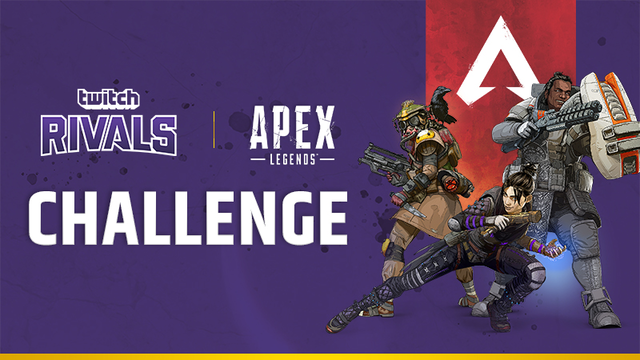 All we know so far about the Twitch Rivals Apex Legends Challenge is that the 48 streamers will be broken down into 16 three-player teams fighting for points. Five points will be awarded for winning a match, while players will earn one point for each kill. The prize pool breakdown can be found on the tournament website. Welcome to TwitchRivals’s channel on Twitch. Watch them stream Counter-Strike: Global Offensive and other content live and join the community! The event can be watched on the TwitchRivals account, as well as the individual stream of each participant. This article will be updated when more information about the Twitch Rivals Apex Legends Challenge becomes available.